The ElBraille is a portable device designed for users who are blind or deaf-blind and want to stay connected at school, work, or home as well as on the go. The twenty-first century, take anywhere replacement for the dedicated notetaker. ElBraille combines the power and flexibility of a modern mainstream computer running the Windows 10 operating system with JAWS and a Braille display with a full Braille keyboard to offer a fully accessible compact computer. Run any Windows application such as Microsoft Word, Excel, PowerPoint, or Outlook. Use FSReader to read DAISY books from sources such as Bookshare.org or browse the internet with Microsoft Internet Explorer or Mozilla Firefox. 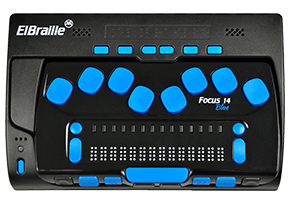 ElBraille also includes a set of specially designed apps for performing popular actions such as the creation of voice or text notes, listening to audio content, and more.